Do you like Monmouth town in Wales? What? You have never heard about this small 10 thousand people town? OK, me either. And one Monmouth’s citizen John Commings decided to change this situation. The patriot-enthusiast John Commings in common with town powers and Wikipedia during half a year created a project and the whole town was covered by QR signs. They are everywhere, in all public places and important town objects: tourist attractions, memorials, parks, historic buildings. Smartphone or tablet computer through the camera or application scans this QR, recognizes it and open Wikipedia articles. The MonmouthPedia project appeared and this town became the first participant in the project “Wikipedia city”. The 19th of May, 2012 there are more than 1000 QR-signs. They send you to all articles including the new ones which are more than 450. All articles are verified and corrected by architects, local historians and other scientists. Besides they are translated into 25 world languages for tourist from every country. In the future Monmouth wants to translate the information into 250 languages and then it’ll become the first town with such huge multilingual tourist information. You can find boards everywhere even on the shops doors and windows where you can know about traditional for the town professions and trades. 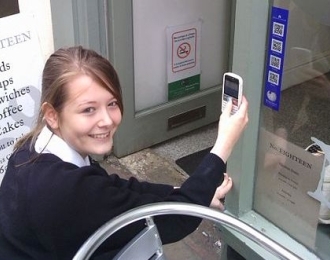 For example, on the pastry shop’s doors the QR tells about bakeries history in Monmouth, about bakers’ profession and traditional recipes. The project development could be not possible without the Monmouth’s government support. 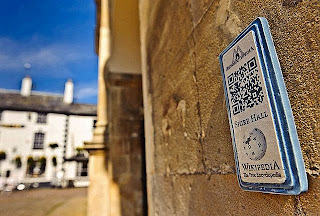 Officials provided Wi-Fi for the whole town and it is the first example in Wales the free Wi-Fi in the town. Volunteers worked actively also. They helped to add new articles and photos to the Wikipedia, they wrote and translated a lot of information. Even the special volunteer’s competition began. The MonmouthPedia is an excellent example of how local community can became the generator of town contents. This way is very success to make tourists to speak well about Monmouth and at long last to give a value to historical heritage. It’s not difficult to do such thing in every small town. All technologies are well-known to everyone and the project doesn’t need big investments. This experience claims attention of towns which want to increase its cultural, tourist and invest attractiveness.